Trav's dreadneck pizza in downtown Btown. Lundquist Brothers playing a little set to celebrate the release of the SwitchYard Compilation Vol. 1. The CD / show includes some of the favorite performers from our Acoustic Sunday House Concert Series - Zionna Riley, Alex the Kidd, Elsie White, etc. 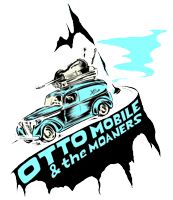 ©2010-2019 Otto Mobile and the Moaners. Site built by Connor Jon O'Sullivan.